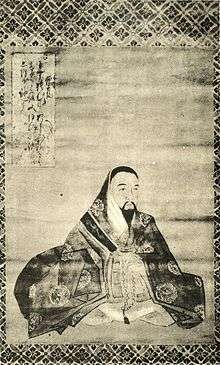 Emperor Go-Kameyama (後亀山天皇, Go-Kameyama Tennō) (c. 1347 – May 10, 1424) was the 99th emperor of Japan, according to the traditional order of succession. He ruled from 1383 to October 21, 1392, becoming the last Emperor of the Southern Court. His personal name was Hironari (熙成). This Nanboku-chō "sovereign" was named after the 13th century Emperor Kameyama and go- (後), translates literally as "later;" and thus, he may be called the "Later Emperor Kameyama". The Japanese word "go" has also been translated to mean the "second one;" and in some older sources, this would-be emperor may be identified as "Kameyama, the second," or as "Kameyama II." He was the second son of Emperor Go-Murakami. His mother was Fujiwara Katsuko (藤原勝子). 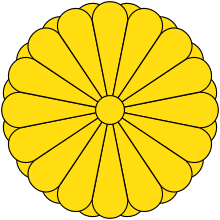 Go-Kameyama acceeded to the throne during the turbulent Nanboku-chō period during which rival claimants to the Chrysanthemum Throne gathered supporters around them in what were known as the Northern court and the Southern Court. Go-Kameyama became Emperor in what was called the Southern court when Emperor Chōkei abdicated in 1383. On October 15, 1392, at the insistence of the peace faction amongst his own courtiers, he applied to Ashikaga Yoshimitsu for peace; and he subsequently returned to the capital where he did hand over the Sacred Treasures to his Northern Court rival. In doing so, Go-Kameyama was understood to have abdicated. By the conditions of the peace treaty, the Northern Court and the Southern Court were supposed to alternate control of the throne. However, this was thrown out in 1412 as Emperor Go-Komatsu renaged on the treaty by abdicating in favour of his own son. Henceforth, no Southern Court claimant ever sat on the Chrysthansemum Throne again. Still, since 1911, the Japanese government has declared the southern claimants were actually the rightful emperors despite the fact that all subsequent emperors including the then-Emperor Meiji were descended from the Northern Court, reasoning the Southern Court retained possession of the three sacred treasures, thus converting the emperors of the former Northern court into mere pretenders. Following his abdication, he went into seclusion; but, in 1410, he returned to Yoshino. The Imperial Household Agency recognizes Saga no ogura no misasagi (嵯峨小倉陵) in Ukyō-ku, Kyoto as his tomb. The years of Go-Kameyama's reign are more specifically identified by more than one era name or nengō. Eras merged as Meitoku 3 replaced Genchū 9 as Go-Kameyama abdicated. ↑ Sansom, George (1961). A History of Japan, 1334-1615. Stanford University Press. pp. 117–118. ISBN 0804705259.